What is a Mass Air Flow sensor (MAF)? 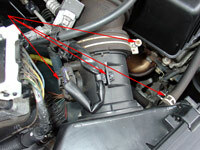 The mass air flow sensor is located directly in the intake air stream, between the air cleaner and throttle body where it can measure incoming air. The mass air flow sensor converts the amount of air drawn into the engine into a voltage signal. The ECM (Electronic Control Module) needs to know intake air volume to calculate engine load. This is necessary to determine how much fuel to inject, when to ignite the cylinder, and when to shift the transmission. 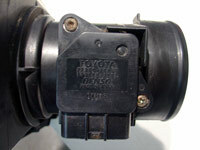 The 4Runner uses a "Hot Wire" type, mass air flow sensor. The primary components of the MAF sensor are a thermistor (a type of resistor whose resistance varies with temperature), a platinum hot wire, and an electronic control circuit. The thermistor measures the temperature of the incoming air. 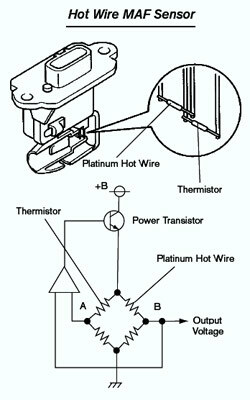 The hot wire is maintained at a constant temperature in relation to the thermistor by the electronic control circuit. An increase in air flow will cause the hot wire to lose heat faster and the electronic control circuitry will compensate by sending more current through the wire. The electronic control circuit simultaneously measures the current flow and puts out a voltage signal in proportion to current flow. Why should the MAF sensor be cleaned? Over time, dust and oil particles stick to the hot wire and bake on. Eventually, those baked on contaminants insulate the hot wire from the airstream. A dirty MAF sensor hot wire may cause many problems including difficult starting, poor acceleration, pinging, rough idling, loss of horsepower and a decrease in fuel economy. The process to clean the maf sensor is so easy and cheap, I recommend it be cleaned every time the air filter is replaced or, as in my case, when the air filter is cleaned for those who use a reusable washable oiled foam air filter. To take advantage of the new found power obtained when cleaning the maf sensor, I like to unplug the EFI relay at the start of this project. 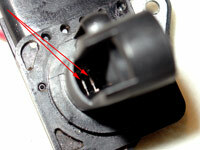 It is located in the engine compartment fuse box. Plugging it back in at the end of this 1/2 hour project is enough time to let the computer reset. 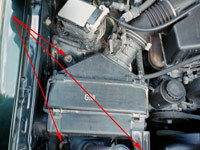 The location of the MAF is difficult to reach and it is much easier to simply remove the entire airbox from the vehicle. Using a 12mm socket on an extension bar, remove the 3 bolts which hold down the air box. Using needle nose pliers, unplug the maf wire harness terminal and then squeeze and pull out the clip holding the wires to the air box. Again using the needle nose pliers, squeeze and remove the clamp holding the vacuum hose to the right side of the airbox. Then with a phillips screwdriver, loosen the hose clamp holding the flex tube to the airbox, and pull this flex tube off the airbox. Pull the airbox out from the air intake elbow coming out of the passenger fender and then the airbox will lift up out of the vehicle. 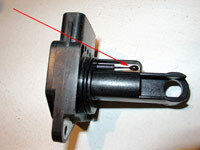 Now that you have the airbox in an easier to work on location, unscrew the MAF sensor from the airbox. This was the most difficult part of the entire process. The screws stripped very easily and could only be removed by using a Craftsman Screw-Out™ Damaged Screw Remover tool affixed to a drill. The screws were replaced with new ones upon reinstallation. Many do it yourselfers use agressive chemicals to clean the MAF such as brake cleaner, carburetor cleaner, air intake cleaner, electrical contact cleaner, etc. These products may damage the fragile platnuium wires or leave behind residues. 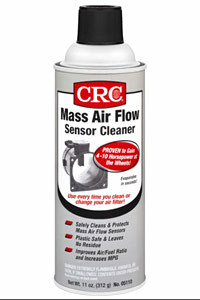 CRC’s Mass Air Flow Sensor Cleaner #05110 is a relatively new product that has been developed to clean all of the contaminants found in the sensors without harming the sensitive plastics and rubber o-rings. It evaporates quickly and completely without leaving any residue which will decrease engine performance and maf sensitivity. The wires on the MAF sensor are very delicate and should not be touched whatsoever. Simply attach the straw to the spray nozzle of the CRC aerosol cleaner and apply 10-15 sprays of CRC Mass Air Flow Sensor Cleaner onto the hot wires inside the housing making sure all sides, wires and connectors are cleaned. Reassemble the MAF and allow to thoroughly dry before reactivating. Put everything back in reverse order and be sure to plug in the EFI relay if you removed it to reset the vehicle's computer.